Excellent crop of floral greens (foliage). 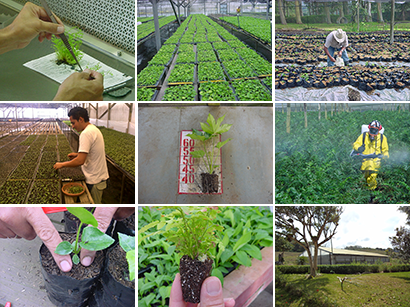 Helechos de Cuero S.A.
Our quality and consistency are the result of excellent crop management, added to careful personnel selection, training and our strategic geographic location in Costa Rica. We have been exporters of foliage since 1991. Our company and the brand Parrot Floral Greens are recognized in the market for their consistent outstanding quality. We strictly select our seeds and operate under rigid management guides in order to have the best crop characteristics and continuous product uniformity. In addition to the result of having excellent agronomic practices, our products are hand graded under strict quality standards, so we ensure that our final product meets the expectations of our customers. Over 20 years experience in exporting from Costa Rica allows us to count with the know-how required in export logistics guaranteeing continual satisfaction from our clients.